Authors can sometimes struggle with final formatting in their novel, especially with first person narrative. Not only is the struggle to edit out the use of “I” important to creating a polished manuscript, but creating a structure that makes it easier for the reader to follow the plot is crucial for proper flow of the story. Some situations can arise that leave writers scratching their heads. One such scenario, the one-sided conversation in first person narrative, can lead to confusing structure. While a skilled manuscript editor is essential for your overall novel, taking the time to review your novel now can save you time down the road. 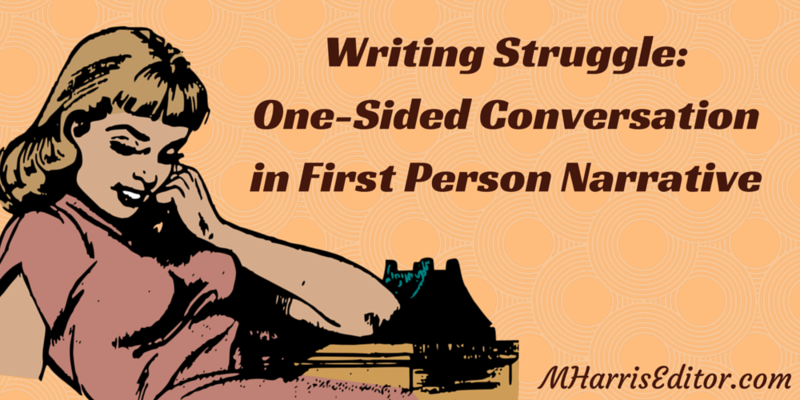 What Does a One-Sided Conversation in First Person Narrative Look Like? This scenario is very specific and may not be in your novel, but it could come up in other ways. 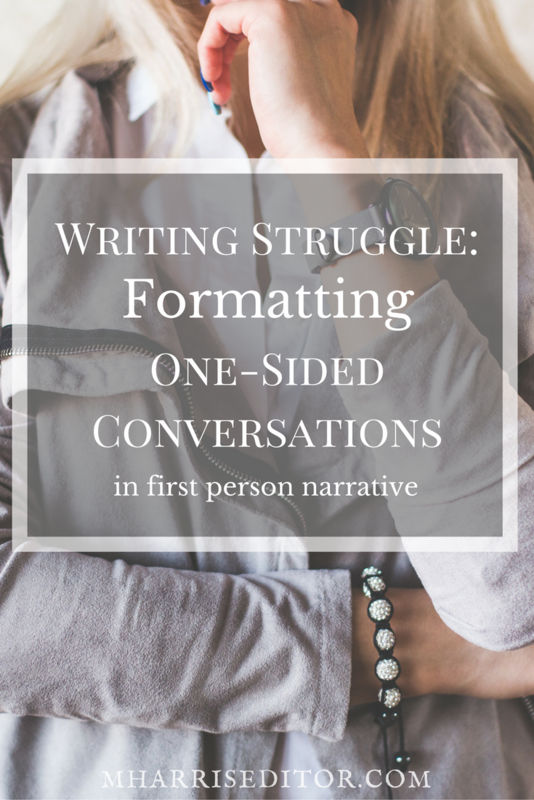 The main way this may come up is if your manuscript includes a conversation in which the main narrator overhears a conversation and responds to it in their own mind, but the reader can see their thoughts. This might happen if the other person is on the phone or is writing someone responses but telling the narrator their responses back, such as in a situation involving text messages or emails. When writing your one-sided conversation, you might have included the responses on the same line as the one-sided dialogue the narrator hears. In other words, the text may look like one large paragraph at the present time. Breaking this up is something an editor can help you with, and understanding the reason why they might break it up the way they do is important. Better Flow of the Story – While you as the writer may have seen your narrator’s comments as occurring close to the one-sided conversation, breaking up the lines as separate makes it easier for your target audience – the readers – to read with ease. Create Tension – Your story may or may not have tension based on context, but using separate, short lines in your formatting can build up to a tense moment, further develop the narrator’s voice, and show their perspective on an outside action affecting their relationship or character development. Build Setting and Visuals – Using the separated lines allows you to add in more about what’s going on around the characters. If the narrator is observing the speaker, adding more about their expressions and bodily movements, including this in your story adds depth. Below is a short sample to give you an idea of how formatting a narrator reacting to a one-sided conversation may help break up your text. Of course he’s lying to his shrew of a wife – like she would really suspect he’s with me again after work. Many writers might prefer to include their narrator’s thoughts in italics to break up the narration and the thoughts. This is fine, but if you are writing in first person narrative, your narrator’s thoughts are already known to the readers, so italics are not necessary. Italics may be preferable if the narrator’s thoughts change tense or for emphasis. For example, if the narration is in past tense and a thought is in present, italics may be helpful to build tension and emphasize the immediacy of the thoughts. You do not have to go it alone when reviewing your manuscript prior to publishing. Megan Harris is an experienced manuscript editor located in St. Louis, Missouri with experience working with small press publishers and self-published authors on their books. If you have a manuscript you need reviewed, contact Megan to discuss your project.